You are here: Home / Timber Infestations / 'Woodworm' / Common Furniture Beetle (woodworm), infestation; Quick guide for consumers and surveyors too. WOODWORM! oh dear, it is a scary name for sure. Fortunately it’s not usually as big a problem as first appears, however, there are exceptions. Most of the time though, remedial work involves replacement of the odd floorboard or two and a spray with a suitable HSE approved insecticide. The thing is, Common Furniture Beetle (its common generic name), is happiest when infesting damp, deadwood, strewn over a forest floor, rather than the dry stuff in houses. Wild wood is wet and subject to fungal and microbial attack, so CFB can thrive within the timber; reducing the wood to hollowed-out trash in short order. 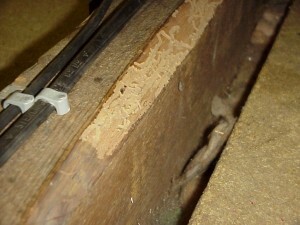 When timber in a building is infested, conditions for the insect are not usually ideal. As a result progress is usually slow, with a higher natural mortality rate, slower growth and less damage from each generation of activity. However, not much moisture is needed to help things along, if there is any excess moisture present, woodworm will thrive. In houses that means that particular care is needed under poorly ventilated floors, shower rooms, bathrooms and such. It’s not unusual to find a light to moderate infestation in a house and then discover that the sections of floor under the kitchen sink or shower tray are very heavily infested, often with structural damage. The problem is compounded by the female insects habit of laying eggs in the old flight holes left from the previous generation. Thus the infestation gets going faster in damp areas, then accelerates again with each laying season. There are some who say that woodworm is not a problem in centrally heated houses; this is not supported by any evidence I’ve seen over the last 30 odd years. I’ve seen it in everything from small back-to-backs and terraces in Armley, Roundhay and Harehills, through to rural cottages and the posh des res in Wetherby, Allwoodley and Harrogate – wood is food for these guys and whilst moisture content plays a big part, it will happily survive and even prosper in relatively dry wood. Remember that wood is hygroscopic, so it will quickly absorb moisture vapour from air – it does not need to be physically splashed with water to become moist. 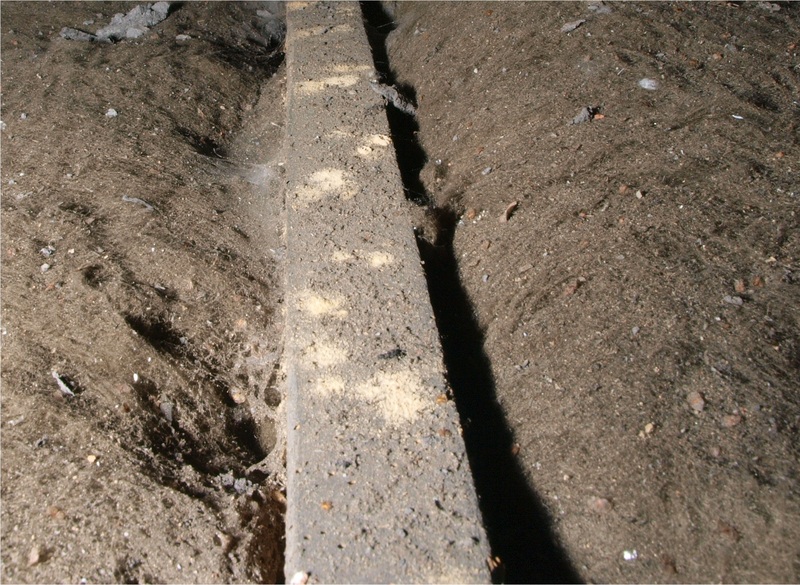 The holes seen below are typical of CFB. However, in practice it’s surprising how they can be missed. To have the best chance of seeing them use a torch and don’t shine the torch straight at the wood. Hold the torch flat against the surface so the light is shed across the surface, rather than directly at it. This will throw any undulations, bumps and holes into relief and they show up much more easily. Also, remember that any piece of wood is divided into sections; Heartwood and sapwood. Heartwood is from the middle of the tree and is usually a little darker in colour and denser. This is due to the waste products deposited in the ‘core’ by the tree as it grows (all trees grow by adding new wood under the bark, around the outside – sort of like an onion adding another layer to the existing mass. The Heartwood is less palatable to woodworm (provided it’s not rotting due to fungal attack, in which case it’s fair game). The sapwood on the other hand is new and fresh at the point the tree is felled. I suppose it’s a bit like meat; most of us prefer spring lamb to tired old mutton. Sapwood is full of the sugars and nutrients the tree was using to grow and the wood is less dense and contains none of the toxins which are in the heartwood – sapwood, particularly moist sapwood is woodworm central. Let’s go hunting for Common Furniture Beetle. Underneath the floor is the best place to look for the small holes, but if that’s not very accessible, try looking around the edges, especially under windows (adults usually fly to light and white colours like window sills), around the WC pan, next to the shower tray etc., here is where the holes will eventually appear, even if the first generation emerged elsewhere. If you have a cellar, then you are at higher risk;. Cellars are where the firewood was stored and that’s where most of the woodworms gets introduced to the home environment. The cellar ceiling may be made of lime plastered timber laths. These are pure sapwood, often ‘riven’ from the edges of raw logs (you can tell this if the laths have undulating edges, rather than flat square ones). 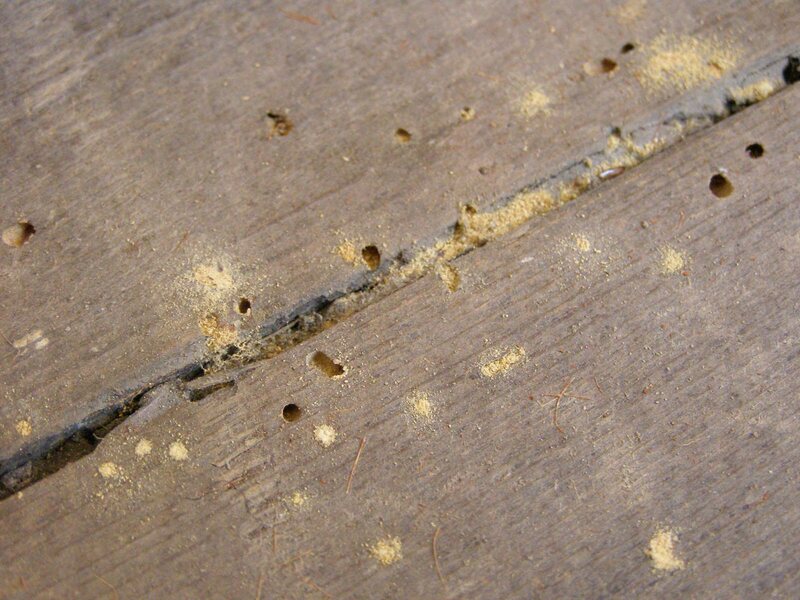 If woodworm is in these, it emerges into the void above, which is a cosy environment and they have a good chance of meeting the love of their lives and laying eggs in the void – concentrating the infestation. Joinery in cellars may be unpainted and will have a higher moisture content, so check it all. Anywhere, but for starters try the ceiling joists and trimmers around the access hatch and the spars next to the chimney (where it may be moist and where light may leak in). Any light when you turn your torch off? Have a look there. Look out for any spars with ‘wany edges’, where the bark has been. This indicates very high sapwood content. If you find something here though, check it’s not just Bark Borer Beetle, which is the civilised cousin of woodworm and quite harmless. Anywhere of course, but look at the edges of the treads in particular; the treads and rises are often ‘flat sawn’ so the curved (bullnose), edge of the treads may have a high sapwood content, which is ideal for woodworm to thrive in. Do look at the stair strings and joinery too though. Not only solid timber is attacked – woodworm is very partial to old plywood. In the past plywood was glued with casein, which is basically stewed animals. The sandwich, of this goo and cheap timber, which is unsuitable for conversion to anything else (high sapwood content again), is perfect woodworm fodder. Electricity and gas meter boards, panelling under stairs and in old pantries and such are all places to check. When I first trained as a timber infestation surveyor, back in the early eighties I was privileged to visit The Princess Risborough laboratories, where many of the treatments and research in woodwork control were developed. The scientists used rack after rack of casein glued plywood to breed woodworm for testing treatments on. So you’ve found holes and think it maybe woodworm? Ideally call in a specialist surveyor who at least has CSRT or CTIS certification. Most companies who are members of the Property Care Association will have this minimum qualification. Don’t entertain anyone who spends time and money advertising themselves as a specialist, if he hasn’t the time or money or sufficient respect for you, to bother getting qualified. Is the woodworm active? This is where some skill comes in. CFB has a breeding season just like many creatures. This is the ‘flight season’ when mature larvae pupate below the surface of the wood and emerge as beetles to mate and lay eggs. Summer is the season of love, but the period is a bit flexible in houses, due to heating and such, so you may get fresh holes anytime between about May, through to September. New holes are usually part filled with ‘frass’ which is the poo of woodworm. A trained specialist can identify the species of the infestation just from the texture, size and colour of the pellets. The size and shape of the ‘flight holes’ is also crucial of course. Risk assessment of the chance of leaving the infestation as opposed to treating it. He should then be able to provide a recommendation based on sensible methodology – it is not good practice to just recommend treatment whenever flight holes are found. If a surveyor recommends treatment or diagnoses woodworm and does not recommend treatment, ask why – he should have a reason for any recommendation. Beware unqualified ‘specialislist’ recommending widespread treatment for “woodworm”. 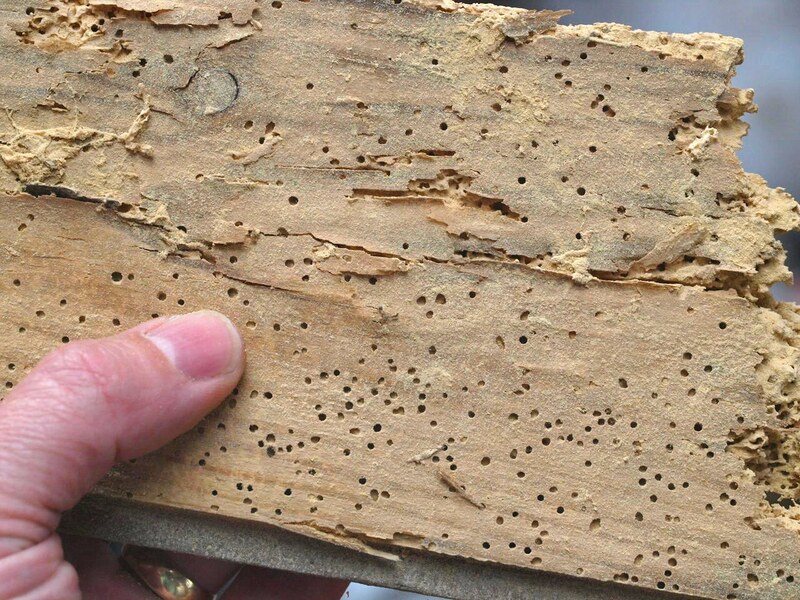 Make sure that the surveyor identifies the species infesting the timber including the latin name so there’s no confusion – see this previous post to see how much can be saved if you take care and avoid being conned – what is woodworm? I’ve treated many hundreds of infestations over the last three decades. I don’t have two heads and as far as I know, nether do my sperm. 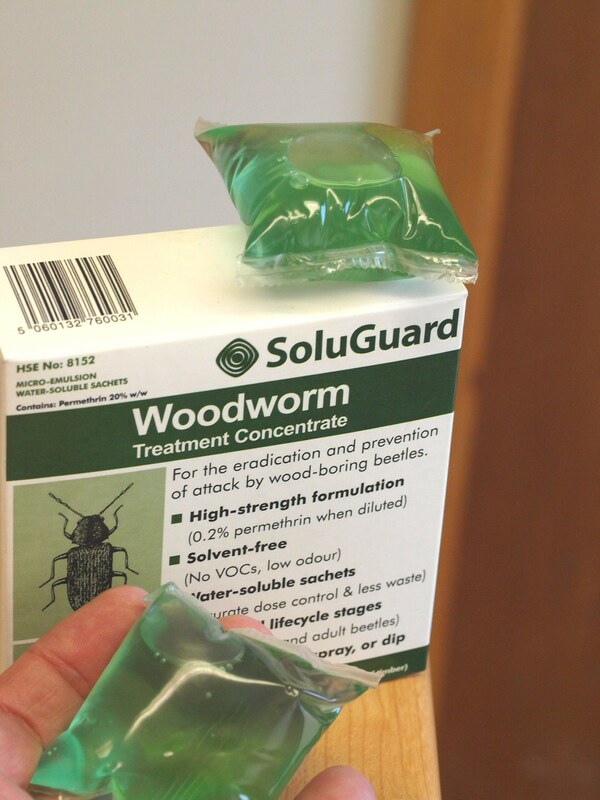 There’s been lots of publicity; shouting about how dangerous the chemicals used for woodworm treatment are. Publicity is often another word for rubbish – just read the Daily Mail or The Daily Star for example. The facts are that there is no link between any of the modern Health & Safety executive approved treatments and ill health. I wouldn’t drink the stuff we use, just as I wouldn’t drink bleach or after shave (I’ve drunk most other things though). It must be used only when needed and must be applied by trained and certified technicians, under the guidance of a qualified surveyor. If that is done there is no risk to you. Technicians, using the stuff every day are at risk of course, so that is why they are togged up like astronauts. Cats and goldfish are exceptions – cats have died as a result of permethrin toxicosis when tolerant dog flea powder has been mistakenly applied to them. Permethrin is very dangerous to aquatic life. This needs to be taken into consideration when it is used and especially when waste product is disposed of. It is safe once it is dried into the wood; cats are at risk during treatment and for a short time after though (this is less to do with permethrin than cats – they also drop dead because they love drinking anti-freeze….. I have two cats and they are both weirdo’s). Modern treatments include a variety of chemicals, though for most infestations I recommend a Permethrin based insecticide. Permethrin is a synthetic pyrethroid with very low mammalian toxicity (cats excepted), It kills woodworm stone cold though. It is a contact insecticide so it will protect wood from re-infestation and will kill adults emerging from below during the flight season. A thorough spray to ‘run off’ is all that’s required. Boron products work well too, though these need to be ingested so are less effective on severe infestations; they have a dual action though, inhibiting fungal growth too. It’s a question of balance and a decent timber infestation surveyor will make a judgement on the most appropriate product. I’ve gone on a bit, but do please ask if there’s anything else you’d like to know. I survey anywhere in the Yorkshire area, so you can always give me a call at Brick-Tie preservation if you need specific advice or a survey. Outside Yorkshire, try the Property Care Association Web site, which has a nice ‘find a contractor’ and ‘find a consultant’ section; just type in the area and you’ll get a list of my fellow members. Hi. I have just treated some timbers with Wykabor 10 following discovery of a significant amount of “dust” in several areas beneath the oak beams. Since treating, everything went quite but now there are signs of more dust in a few areas. Does this signify treatment failure or is it normal as I assume the larvae inside the wood will still develop and emerge? I’m not sure at which point the treatment kills the problem. Wykabor is a boron based fluid. It works superbly as a fungicide. Boron does have insecticidal properties and will protect wood from attack by woodworm. However, it works as a stomach poison and they need to ingest it to die. It’s not instant death either so the material must be penetrated into the wood so the grubs can’t avoid it. This is why we don’t use boron to eradicate anything other than a very light infestation. Anything else needs a contact insecticide. Permethrin based products kill on contact so they are active against all stages of the insect. Eggs, larvae and adult beetles. Get som epermethrin base 0.2% active is best. Hi, Great blog, thanks for sharing your expertise. I think I may have read too many articles about CFB however and go from being reassured to paranoid in the same day! My son recently bought a house built around 1850’s with a cellar. Nothing picked up on normal survey. The house has been empty for a few weeks now as he has been decorating. Over the last month he noticed an odd beetle which we now realise is CFB, he caught one and the council identified it. In total he has seen around a dozen in 4 weeks, not noticed any frass although he has yet to take the carpets up to fully investigate, there are a few holes in the cellar timbers but they may be old.The loft is inaccessible, very small space with thick insulation. The plan was to try and take a DIY approach but not sure what is considered to be a light/heavy infestation. Any advice would be appreciated. Sorry for the delay, I have a surveyor on holiday so I am working and theblog is not my full time job. On th eone hand live beetles come from somewhere, so it’s likly that there is activity. However, the carpets need lifting and a thorough inspection carried out before you consider any treatment, professional or DIY. It may be an isolated area, requiring disposal of the woood or topical treatment. I’ve recomedn that you ask a surveyor to do the inspection, but armed with the hints and tips I’ve offerd in the post and the above answers to others, you should be ok if you want to do this yourself. My very elderly neighbours have an infestation of little black mites around all the window ledges. The local council told her they were biscuit beetles but i am not so sure; they arent in the cupboards but hundreds along the wooden window frames. Do you think its possible they are biscuit beetles?? They (the couple) are approaching 90 and 93 years old and its a very big house. She is reluctant to pay someone as she is afraid of being conned or her cats being poisoned, and her husband is very sick at moment so its not really a priority for her. Is there anything she can use safely herself or can you recommend someone in Tameside to have a look? Keep up the excellent work. Not many folk like you around, thank you! I would say that black beetles may be one of the forms of buscuit beetle but the common Stegobium is brown – just like common furniture beetle. Tameside is a long way off and I don’t have a buddy there. I’d recommend a dust pan and brush, they are probibly harmless. if they are activly running about they are not CFB – they are a bit lazy! best regards and thank you for your very kind comments. I wonder if you are able to give some advice? We have at least two bedrooms where a faint munching sound can be heard at times seemingly within or above the plasterboard eaves. One area has a spotting stain appearing which doesn’t seem to be damp and is a pale brown colour. We live in rural Surrey and have only a very small loft space – the sounds seem to be in the eaves rather than the loft in any case. No insects such as wasps seem to be coming and going. Do you have thoughts as to what might be causing the sounds and stains, please? I have no idea but not my field – almosty certanl;y not any kind of wood borer. Maybe birds, rodents, bats? Maybe call inthe local environmental health officer? I have a 200 year old,10 bay barn with no history of chemical treatment for woodworm. There are many areas of CFB holes in some timbers and some frasse but it’does not seem to go deep. The wood is very hard bellow 1 cm. I would like to treat affected areas but need to know which areas I have dealt with. Do the boron treatments contain a lasting colourant please. Thank you for getting in touch. What you describe is very typical of CFB instestation. The heartwood under the sapwood outer layer will barely be touched. It is only vulnarable if the timbers get wet and start to decay. You say there is frass? Is this just visible when you knock the wood and poke it with a screwdriver? If so the infestation may be long gone. Also, if the large section timbers are mainly heartwood, then the softening of the sapwood is almost harmless, so don’t worry too much. Why not pick a patch and monitor that and see if any new flight holes appear? If they don’t you’ll save yourself treatment costs and help the environment. If they do, try a permethrin based insecticide, rathar ethan boron for this one. In the UK new EU regulations have just priced almost all manyfacturers out of the production of chemicals for timber treatment, so your options are limited.. Many thanks for your excellent article. I wonder if you can help me with something that is nagging me. I have an infestation of woodworm in my ground floor timbers. I noticed this around February this year. I was unable to treat the timbers until August. I can remember my old carpentry and joinery lecturer telling us (over 30 years ago) that there is something that can be placed near to the infestation and will kill the emerging adult beetles. I have been unable to get hold of this or even find out its name. I desperately did not want further ww damage so I wondered if moth balls would do the trick. I put about 15 packets of moth balls under the floor at the end of April. I have just opened up the floor. 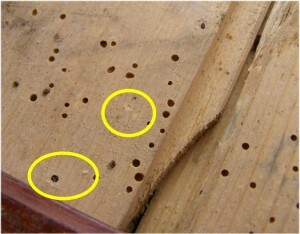 One piece of wood had a number of exit holes with a number of dead, adult beetles right next to them. So it appears my cheap and nasty attempt to halt their progress has worked. I had never heard of this before, have you? Do you know what the active chemical is that kills the ww? Also do you know when they emerge as adults? I have read in spring but others say summer as well. Thanks for getting in touch David. When WW emerges you will often find dead adults around nfested timber. They will mate and lay eggs inthe old flightholes and then die. I haven’t heard that ww is killed by moth balls. One old treatment which works during the spring and summer flight season is Dichlorvos strips. These were marketed as fly killers but if placed in an infested confined space, like a sub-floor or loft, they did kill emerging adults. However, the active ingrediant is quite nasty really, as it is a organophosphate chemical. EU Biocidal Products Directive (BPD) did not approve the use and so it has been banned in all UK insecticides since 2012. Ministers took action in 2002 to suspend the sale of all insecticide products containing dichlorvos and then withdraw the approvals of non-agricultural insecticide products as a precautionary public health measure. Common furniture Beetle has a long flight season. May to September is the main window, but what with the warm weather and central heating this can broaden. It helps enormously. Thank you very much. Thanks for this helpful article. I’d be really grateful for your advice on a problem that we may (or may not!) have……we were given an old pub table that we used for a couple of years. It had a few little holes on one end of it but I didn’t think anything of it. We moved overseas for 8 years and this table was stored in our loft. When we have come to remove the furniture from the loft, the table now has hundreds of holes all in the surface (small in nature like the common furniture beetle). We are therefore very concerned that we have now infested our loft with woodworm! We are not actually living there at the moment and so are unable to just pop up and have a look but would be grateful for your advice as to whether you think that we should definitely get someone out to spray. Many thanks. Take a torch and enter the loft. Hold the torch so that the light beam is at a right angle to the wood – in effect shining across the wood. Check out the rafters and cieling joints. If ther are no holes, make a note and carry out this inspectionevery year. If holes appear then treat it (professionally via a PCA member). Don’t worry, CFB is not like cartoon termites – progress is slow and spray treatment is not very expensive. Alternativly have a PCA meber do these surveys for you. Don’t just forget it or if the roof is infested then damage could occure, but it takes a few years if the roof is not damp. Hi. Recently had a wood burning stove installed and have bought in a decent amount of seasoned hardwood for the winter. I’ve brought much of it indoors for storage. Is this very risky in terms of woodworm? My house is 1910s, pine exposed (but polyurethane lacquered) floors, etc. We don’t have any problems with damp, which I am quite vigilant about. Hello, we have just bought wooden floor (non varnished) but I found out that some pieces of it had Woodwarms ( I bought 100 square meters and found less than 10 square meters had holes when flipping them). Do I need to send back the whole order or by throwing away the infected pieces I will be ok? Thank you in advance for your help! Hello from Greece. I am posting my question again with some further details. We have just bought wooden floor (non varnished) but I found out that some pieces of it had Woodwarm holes. It was stored in a warehouse for about 10 years and not in great conditions. I bought 100 square meters and found that less than 10 square meters had holes when flipping them). Most of the wood is dark. The holes were only at the edges (there the wood was whiter). Do I need to send back the whole order or by throwing away the infected pieces I will be ok? Is it possible the rest that look ok to be infected without being able to tell? Thank you in advance for your help. I will be really greatful if you answer me because I would love to keep this wood but I am scared of it right now. I can’t diagnose which insect this is so it’s hard to tell you. The wood is ‘second hand’ so you probibly have no claim for replacement. I’d treat it with a safe approved woodworm fluid and it should be fine. Fought some battle with ww beetles emerging from little wooden toy fire house in my sons bedroom it appears burgers were originating from wooden sling missus brought from Africa in April. And as room has wooden floor boards which are varnished I need to know if need to lift these too and treat that area too? Needles to say both items have gone to skip already…ww beetles are circa 5 MM. long black and look like common house ones. Any help and advise would be great. Probibly a pest of hardwood, so your floorboards should be fine (unless they are hardwood). I wouldn’t worry. Likly a powder post which needs a high starch content and large pores for egg laying. Hi I recently built a “rustic” oak dining room table, it has been in the living room for a couple of months and when I dismantled it for oiling I found 4 to 6 worm holes in a small section of sapwood in one plank. I assume the worms were present before construction and could well have snuck across on a lorry from France. Is this something to worry about or should I just keep my eyes open? Just keep an eye and relax…. I’m pleased I came across this page and wondered if you can advise me. My partner and I moved into a bungalow in June, which needed some cosmetic work i.e. rendering and garage roof felting etc. There was also a floorboard broken in our dining area which we asked our builder to replace at the same time. When he lifted the carpet and pulled the floorboard up, it was full of holes, much like the one pictured above. It looks like the ones behind it against the wall are pretty new so have been replaced before. Our builder is coming back soon to finish the work he started, and also he recommended replacing about half a dozen of the other floorboards around the one he’s already replaced. What I’m worried about now is there are other gaps or creaking floorboards in the bedroom and hallway so I’m getting paranoid that they might be in other parts of the house eating away, although it could be age as it’s a 1920s bungalow. We want to get vinyl flooring put down so need to get this sorted first. Is there anything different you would recommend and is my worry justified? Yoy really need to have it looked at by a qualified surveyor, with knowledge of timber infestations. Look for the letters CTIS or CSRT after the surveyors name. This confirms that he has had his knowledge fo timber infestations tested by examination. Great blog thanks you !! You really ought to have the house surveyed by a qualifed timber surveyor. Thse have CSRT or CTIS and will know woodworm form other similar looking pestes. I’d recommend you visit the Property Care Association web site and look for a contractor or independent surveyor. I have discovered a group of tiny pinpoint wholes in a plaster wall. I have found similar but smaller groups under a couple of window sills where there also appears to be damp marks – could this be woodworm. I doubt it is woodowrm but really, you need someone to look for you. Try the PCA web site for a local specialist. Just spoke to someone in your Leeds office who offered some very helpful advice… There’s a lot of conflicting information out there regarding CFB, yours seems the most balanced and honest. Your not based in my area but for anyone reading this blog who is I highly recommend. just moved into a rental cottage and found active woodworm (clean flight holes, some frass). It’s an old property and most of the exposed timbers have got historical woodworm damage, but some of the fresh holes are in modern timber that can’t have been there very long. How worried should I be about it spreading to my furniture? Plenty of websites say “don’t worry, woodworm isn’t infectious” but they tend to be the same ones that say it doesn’t live in centrally heated houses. We have central heating, but we also have a damp problem. As others have said, there’s a lot of conflicting information out there but you seem to know your stuff. Thank you for ypur kind comments. I think I do know a bit about these things. The timbers ought to be treated really. However, assuming that is not happening let’s cover the furnitire situation. Timber furniture which is varnished, very dry, finely sanded or polished is not really at any significant risk of woodowrm infestation. Modern furniture with laminate and chipboard etc is immune. If you have very valuable rough sawn antique stuff then it is at ‘slight’ risk. Bear in mind that the roof void has a hatch (which I assume is closed most of the time). Your stuff would be at risk from woodworm infestation if you stored it in the roof void, but otherwise it’s only at the slight risk everyone else’s furniture is in (they can fly through an open window is summer). Thank you for the quastion – relax. A recent homebuyers report on a house we are buying identified flight holes in the timber of the attic. We asked the vendors for any previous treatment guarantees and they have advised that they knew the holes existed when they purchased the property but the vendor at the time told them he had treated the attic himself so there was no guarantee. As there was no guarantee we asked if they could get an inspection and report done so that we could see what, if any, active infestation was present. The vendors have advised us that they got two companies in and one of the companies had told them that ” there was no evidence of active woodworm and could not justify treating this house for woodworm protection”. The other firm has told me directly that “They didn’t see any evidence of the beetle present but there were a lot of flight holes which need treatment as it’s impossible to say when they were last active”. Neither company noted any evidence anywhere else in the house, floor boards etc all clear. I just don’t know what to believe or what to do – I am concerned that with evidence of flight holes unless there is a guarantee that the attic timbers have been treated there may be activity that is not evident or visible. Also if we want to sell the property is 5 or so years time and the next buyer wants proof that the woodworm isn’t active they may insist on a guarantee and the cost will fall to us to get the attic treated. Thank you for getting in touch. Sorry for the delay. I would say that the firm who say they don’t see any justification may well be right. Make sure their report has you named as the client and hold onto it. You could of course still ask for a discount just in case. Then just monitor the situations. Mark a section of infested timber and paint it with emulsion. If it is active then within a year or two you’ll have fresh holes in the paint. You can use a pencil to mark holes or even wallpaper the section if you like. I don’t like it whan companies recommend treatmet just because there aer woodworm holes, so I’m not convinced by the other chap or lass….. mind you, I can’t survey via the internet I’m afraid. I have a 60’s bungalow with a suspended wooden floor. I have access to a medium sized storage area under the property where I can see evidence of woodworm activity in some of the joists and floorboards. Frass has collected under a joist so I presume they are/were active recently. The wood that I can see seems to be structurally sound. I could quite easily treat this area myself, however the rest of the space under the property has only about 2 foot of height and small gaps to climb through so inaccessible. We have newish carpets and don’t really want to start ripping them up. What are my options? I’ve heard there are foggers and some companies offer fumigation services but how effective are these and are they expensive? Thank you for your nice comment. If you are convinced the infestation is active you should call in a specialist for specifc advice. I’m not convinced by ‘fogging’ methods as the load of insecticide left on the timber is really very slight. Spraying the wood directly with a safe micro-emulion type contact insecticide is the best way. The carpets will need lifting so you’ll need top factor in the cost of that. Thanks for your article – v.useful! Just a quick question really. I was given some logs by my father to burn on my open fire yesterday which was stored in a cardboard bag at the top of my cellar. The last two logs were clearly wrotten as they were very soft, light but dry. I might be being over paranoid but could some furniture beetles have wingled their way into my cellar or floorboards of my house in that short period of time as the bag itself had holes in it & there sawdust where it was? It’s impossible to say really. Just imagine how much firewood has been in the cellar since the house was built? Quite a lot probibly so the timbers will have been at risk of woodworm infestation for all that time. Relax if you can, there is always a chance of infestaion so don’t store infested wood there knowingly. But also don’t panic on the odd occasion you do so by accident. I have made a rustic farmhouse table top from French Oak, what is best to prevent it from being infested by Woodworm or other insect attacks? As it is a dining table I would obviously try steer clear of any toxic chemical based treatments. If you don’t want to varnish it just keep it dry = infestation is unlikly. Sorry I was so consumed with my problem I forgot tell you how great this article is. I feel very informed and better able to judge myself having no woodworm knowledge whatsoever. Thank you Bryan for taking the time! Hi, I’ve been given some iroko planks from old marina pontoons and I’ve noticed some bore like holes in some of them. I was hoping to use these 4″ planks for the floorboards in a boat that I’m constructing. My question is: what treatment should I use and how is it applied.? Could well be pin hole borer from the timber yard or even Ambrosia beetle. get a sample looked at – you may not need to treat it at all. I caught a few of the culprits last night and am fairly certain the infestation is powder post beetle. You really need a specialist survey to carry out a proper survey. Why not try the Property Care Association web site for a specialist contractor or an independent surveyor? Couple still alive. Sad to see something I spent so much time on ruined. What is the best way to treat and fill in the holes (thinking mix of pva and wood shavings but not sure if the holes are too small/ if it might leave external pieces) could you treat again with spray and paint or is there a possibility the infestation is still there and might later return? I have noticed flight holes in out staircase and have also killed about 30 live furniture beetles in the area. The problem is moisture from a crawlspace below which I am going to take care of. But I had wanted to reclad the old stair with new wood and would rather treat everything first to be sure there are no future issues. The problem is the backside of the stair is not accessible. The treads are about 1″ thick pine, risers about the same. Do the liquid Permethrin treatments soak through very deeply if only surface applied? I have seen injection plugs but typically described for beams. Hi – I’ve got a light infestation of common furniture beetle in my downstairs toilet. The flooring is an oiled solid oak – I can see a few boring holes. What would you recommend to treat? If I can I’d rather avoid having to remove the finish – can you just overcoat with permethrin or something? Be careful using any treatment near electricity. many of the DIY products are solvent based and as such are highly inflammable. Turn the electricity off and wrap the cables and such in insulation to make sure they cannot be splashed. and do not spray the material on the wood. Just brush it on, Any B&Q type product should do the trick for a topical treatment like this. Always follow the instructions carefully. My daughter has just had an infestation survey done on a house her and her husband are hoping to buy. Apparently, the survey found some evidence of infestation in the chipboard against which the electricity meter and fuse box is fixed ( down in the cellar ). What would be the best treatment as I understand most treatments are water based? It sounds like potential powder post beetle infestation. A pest of the wood when it arrived and very very unlikly to be an infestation which originated in-situ – Complain to the supplier of the floor. We bought a relatively old house a few years ago and at the time of survey, woodworm was identified and treated in our roof. We have recently had our heavily black-stained beams in our sitting room lightened up- this was done by professionals applying a white paste and then a new wood-colour stain on top. However, we are now fairly sure we have CFB woodworm as we have new holes with dust around them in about a third of the beams. Do you know which woodworm treatments can effectively treat the problem through three layers of stain? 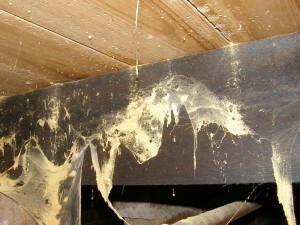 Do you also know if the woodworm treatments affect the stain on the beams, e.g. make the colour run or change the colour? I’m afraid that treatment through stain tends to be a waste of effort. That said, you can try injecting fluid into the flight holes. As for the stain, well I can’t say as this is not my field. Woodworm isn’t like a cartoon termite so there is no big rush to act. Why not use a black soft pencil to mark the existing holes on a blind side of the beams. Wait until late this year and see if there are new ones in the marked area before you decide treatment is needed. Marking is easy – just insert the pencil in the hole and twist to leave a nice black ring. 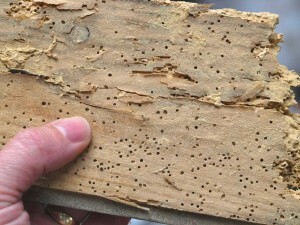 Can wood worm infest hardboard? I’m buying my first home and after my building survey has taken place revealing beetle infestation in the attic and being made aware there’s a possibility of there being activity under the stairs I am petrified senseless! The timber roof in loft, suspended timber floor upstairs (bedrooms and bathroom) and stairs are the main area of concern. I have contacted a timber specialist to come and take a look for £50.00. Vendor is not giving information away easily and is saying he treated the whole property but has no certificate… any signs that could show treatment? The timber needs replacing in the attic, floors and/or stairs. Is it possible to replace timber with other non-wood materials? to ensure it won’t be a concern in the future. Also concerns me floor boards cannot be lifted in the bathroom!! I’m closing my eyes at night picturing the house falling apart and having the rest of my mortgage life trying to gather the money to fix the house! Ha ha. Fantastic blog.. I am so glad I have stumbled across it. Good idea about the fly strips too. Any advice or tips welcome!! This October have brought in to our new build “eco” home logs to burn and believe that the extensive talc-fine frass is from the powder post beetle. The logs will be burned/incinerated within a week of bringing them into the house. Since the house is wooden-framed I am concerned not to risk furniture or structural infestation. I also intend to burn the obviously affected logs from the external woodpile first. Would I be wiser to (reluctantly) burn them on a bonfire, or am I in a safer time of the year as regards their life cycle? Don’t worry about infestation of the house – these are pests of the timber yard and if it is Lyctus it will only lay eggs on the end grain of larger pored hardwood rich in starch. Not softwood or any varnished surfaces. This is one of those times when you need a properly qualified timber surveyor to come and look at it. I recommend you visit the PCA find a member page and see if there is a local one you can use. Check them out – reviews and such. I’m sorry but I can’t really survey via the web – good luck with this though. We have moved into a 1950’s solid floor two story conventional detached house. There are no obvious signs of damp except for a couple of small places on the central chimney stack. Recently I noticed woodworm holes on the 1st floor floorboards in an isolated area covering about two square feet, but there is something very funny about the pattern. From the location of the holes it appears very much that the woodworm originated in the 2 x 4 joists and then traveled to the floorboard only where it was directly adjacent to the joist. So the flight holes in the floorboards are very closely grouped. Consequently this indicates to me that the woodworm were in the joists used in the house construction, and further, since they haven’t spread anywhere else, as all the floorboards upstairs are exposed and all other areas are clear, then we think the active infestation may be over. I have a few pictures and wondered if you would like me to post them somewhere and if you would be able to give an opinion? I’d just pencil the holes and then check for fresh ones in a year or so… if no more hole then forget it. What a great site, very easy to lose an hour reading about woodworm! I tried to find an answer to my query in the posts but unsuccessfully, so could I ask you for advice please? I have a Georgian oak bureau with woodworm. It has a horrible chocolate brown Victorian varnish that I will be stripping off. I have read not to clean stripper off with water, as water will raise the grain of oak. Does this mean I shouldn’t use a water based boron woodworm treatment on antique oak? Must I use a solvent permethrin treatment? Many thanks. I’d use the permethrin based product and it will be better than boron anyway which is more suitable for structural timbers which are damp and at risk of rot. Hi, thanks for doing this blog. It’s really helpful. How effective is Cuprinol 5 star wood treatment containing propriconazole and cypermethrin? It’s predominantly for treating timber trusses and beams, these have got damp and gone soft where they come into contact with stone walls and Woodworm has got in, so the idea of being able to treat rot and woodworm with one product is attractive. I did see a small black woodworm-like insect whilst chopping out soft wood so I’m assuming the infestation is still active. Hi, Following the manufacturers instructions carefully will treat woodworm very effectively. If timbers are soft where they are in contact with masonry you ned to check for decay and find out why the masonry is damp. Fix the pointing or whatever is causing the damp… job done.